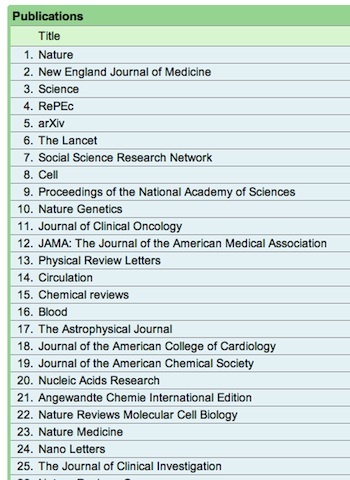 An introductory page outlines the indices used to rank the journals. Note in particular that they’ve excluded very small journals. I’ve mixed feelings about that. On one hand they do have to draw a line somewhere. On the other, there are some small journals that there excellent; it also may be hard on smaller journals trying to get established or review journals which typical have few articles. As an example, one of my favourite journals is Epigenetics and Chromatin (open access); it will likely be excluded because of it’s slim publication output yet is run by well-known figures in the field with fine papers and has a respectable impact factor of 4.73. Similarly Quarterly Reviews of Biophysics, currently with an impact factor of 10.2, isn’t covered (as far as I am able to tell). You’ll note from the example shown at the top that searching can be done in several languages. You can search by keyword* to locate subsets of their rankings; I’ve shown the results for bioinformatics in the Footnotes. Google suggests used this way it could be used to locate what journals to publish in. Readers could also try ‘asking’ JANE – or using that old standby of whatever journal you happen to read most for coverage of the topic you’re writing about! * Best as I can tell there doesn’t seem to be a direct link to this searching mode yet, hence my use of this ‘malformed’ link for readers. 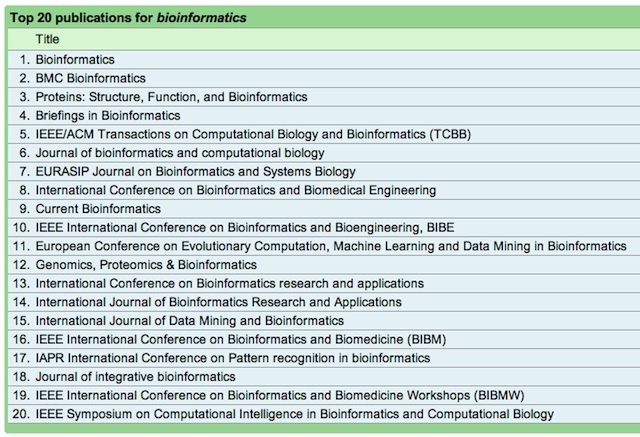 ** Searching on ‘bioinformatics’, for example, gives top spots to Bioinformatics, BMC Bioinformatics, and Proteins: Structure, Function, and Bioinformatics. Searching on ‘computational biology’ draws a slimmer list, headed by PLoS Computational Biology. It would be interesting to see how many of these were open access? 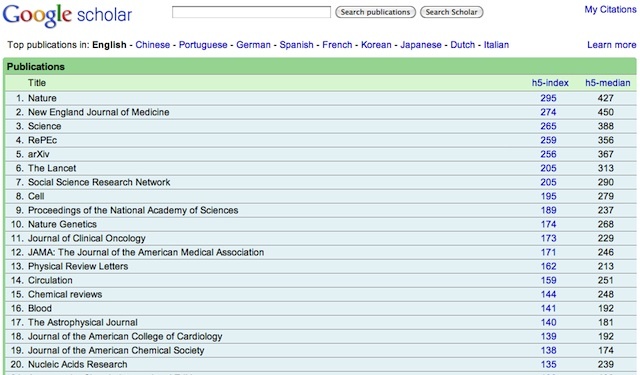 I had a quick look at Nephrology OR Kidney and the journal ranking seems to match the Web of Knowledge (IDI). 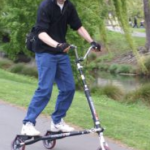 I wonder if PBRF panels will start looking at these? Trial by Google…scary thought. Of the top 25, I know arXiv (an open-access preprint archive, mostly physics/computer science/etc) and Nucleic Acids Research are. There are open-access options for a number of the others. True, but then on the other hand it already feels like trial by index/impact factor and you could argue Google are only crunching the numbers. Blood. What a great journal name. There are medical journals with short, blunt, names for just about every organs (etc.) it seems. One journal Iâ€™ve run into is called Silence. It proved to cover RNA-mediated epigenetic regulation of genes, best known for â€˜silencingâ€™ genes, hence the name I guess. Humorously, the personalisation feature for that journal is called â€˜My Silenceâ€™.